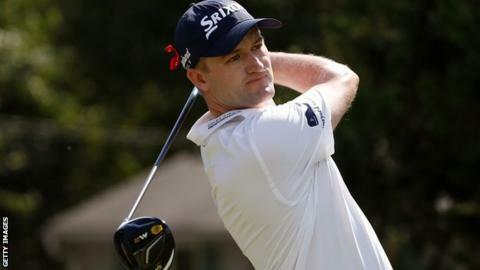 Russell Knox will decide this week whether to push for automatic selection for Europe's Ryder Cup team to face USA at Hazeltine next month. Victory in Sunday's Traveler's Championship pushed the Scot to within touching distance of automatic inclusion in Darren Clarke's squad. But Knox, 31, is not due to play the Wyndham Championship next week - his final chance to guarantee selection. "It's my decision if I play Wyndham or not," he told BBC Scotland. "I could play Wyndham, and there are no guarantees I'll play well. It could be a total waste of time if I go and miss the cut." Knox has spoken to Clarke, who can make three wildcard picks in addition to the nine automatic qualifiers from the European and World points lists, but has yet to make a decision on Wyndham. "We had a brief conversation about my schedule in the next few weeks to try and make the team outright, but I haven't finalised or made my decisions yet," he told BBC Scotland. "I wasn't planning on playing Wyndham. I was going to take two weeks off, and then this came up. I'll probably take a couple more days to think about it and assess if it's the right thing to do. "I feel I've done almost all I can; I wish I could have automatically qualified for the team already. "I don't want to have to wait for a captain's selection; he can pick whomever he wants, so it's not necessarily going to be me. "It would be nice to make the team straight up, but at the same time I feel I've rolled my dice, shown my cards and put everything into it I can. And if I decide not to play, I'll know I'll have given it 100%." Clarke is scheduled to finalise his European team on 29 August ahead of the three-day clash with the US from 30 September until 2 October. Sunday's win in Connecticut was Knox's second PGA Tour win of the year, elevating him to 18th place in golf's world rankings. The Invernesian is only the fourth Scot to breach the top 20 benchmark, after Sandy Lyle, Sam Torrance and Colin Montgomerie. "I read that this morning and I was kind of shocked," said Knox. "There's some stiff company there and it's a true honour to even be mentioned in the same sentence as those legends. "It was a huge goal of mine. I'm going to take baby steps, top 20, then hopefully top 15, and see how far I can go. "I think top 10 would be the next huge milestone. And then you just never know. You get up there, and all of a sudden you can win another massive tournament. It's not something I really think about, it's just an after-thing."